Welcome to Komik, the world’s highest village, nestled in the upper reaches of the Himalayas at 4,587m above the sea level. This village, which derives its name from the snowcock that roams the alpine pastures, bordering snowline, is witness to ways of surviving one of the world’s harshest climates. For generations, Komik residents had revelled in heavy snowfall, often two- to three-metre deep. For them, it heralds sufficient soil moisture for growing their only crop barley, and helps in the buildup of glaciers that ensure year-round water availability. But of late, this village of 15-odd families in Himachal Pradesh’s Spiti district has an influx of unusual visitors—climate scientists and a few media persons like this reporter, accompanied by a photographer. At the core of this changing demography is changing climate. While the residents understand little about climate science, they are now trying to realign their lives around a new reality—less and less snow, receding glaciers and an arid landscape. The Chocho Khanyilda glacier, the lone water source to the cold arid village, has been shrinking over the past 15 years. “Snowfall has also reduced. We now receive less than a metre every year,” says Tsering Angdui, a farmer in his forties. “A glacier spring that would run through the village when I was growing up disappeared in the late 1990s. Even our farm yield has reduced by a third in the past decade. Earlier, we would not have the space to store our harvest. Now, we don’t know how long these lands will support us,” he adds. Angdui’s fears are valid. Several studies suggest that the Himalayan range is among the most sensitive regions to climate change (see ‘The little we know’, p38). Since the 1950s, the cold arid zone in Himachal Pradesh has witnessed a sharp rise of about 1 oC in mean temperatures, as per the State Level Climate Change Trends, published by the India Meteorological Department in 2013. In the past five years, rainfall in Lahaul and Spiti has been so erratic that it indicates an average decline of over 50 per cent in annual rainfall of about 170 mm. 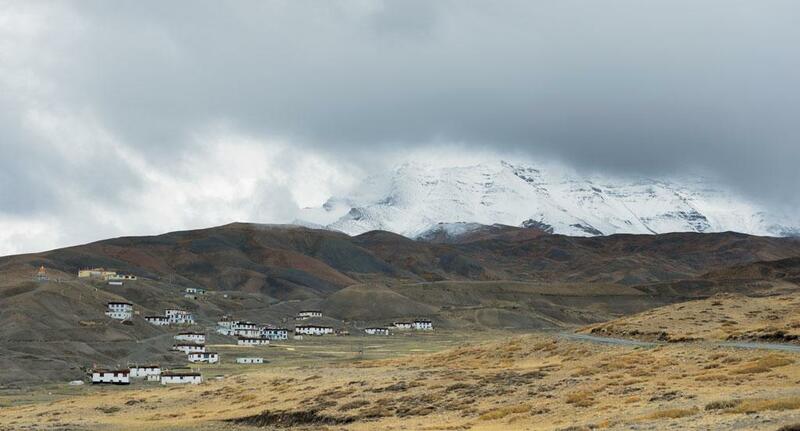 The impact of climate change can also be seen in Langcha, a village of about 170 people located around 25 km from Spiti’s administrative centre Kaza. “Snowfall has almost halved in the recent years. So we now have less water for irrigation. We now experience increased heat after monsoons and alternating cycles of high and low temperatures, which have affected agriculture,” says Yeshe Chhopel, a farmer from Langcha. Similarly, glaciers have drastically reduced in Thankarma, nestled amidst military installations on the border of Spiti and Kinnaur districts. “In the 20 years that I have spent here, I have seen the glacier retreat by about a kilometre. The gulf in the day-night temperatures has also been rising, which is not good for the ecosystem,” says A D Negi, a retired state government employee. The story is equally worrying in Ladakh—India’s only other cold arid district—where annual precipitation is declining at a disastrous rate. Since the 1970s, Ladakh’s snowfall and rainfall have both reduced by close to 1 mm per decade, as per Knowledge Systems of Societies for Adaptation and Mitigation of Impacts of Climate Change, published in 2013. The warming up of the area has meant that farmers in Ladakh’s villages are now moving to new crops, new streams of revenue and of course, new demands of water. “Apples and apricots would never grow at these heights earlier. But it has been possible because the temperature in the region has been rising in the past decade or so. While our incomes have increased 10-15 times due to the new crops, it has also increased the demand for water, which is not easy to find here,” says Tsering Wangdush, a farmer from Ladakh’s Nang village. According to Wangdush and others from the village of about 400 people, surrounding slopes used to be snow-covered all-year-round but now they have snow only at the top. So how are these people combating climate change? While some villages are relying on traditional water distribution systems, others are innovating local solutions. In Langcha village, residents are relying on their traditional water distribution system where all the glacial meltwater is saved in a single reservoir and each family is given a specific time to use the reservoir. “This traditional system has so far been adequate in tiding over water shortages,” says Chhopel. In Thankarma, Negi has afforested a 90-hectares barren forest land by growing trees and crops together. He has used contour farming to ensure that available water is distributed evenly, eliminating the need for irrigation. Additionally, the tree cover in the farm has created a humus layer that has increased the soil’s water retention capacity. “The model ensures maximum water retention and is self-sustaining,” says Negi. “I have currently managed to grow only deciduous trees but I am confident that coniferous trees like pine and chilgoza can also be grown. These will help bring snowfall in the region and might prevent the glacier from retreating further,” he says. In Nang village, residents have created their own glacier to supplement the natural one. “Today, water from glaciers is practically unavailable during April and May, when it is needed the most. So, we created an artificial glacier closer to the village using excess glacial meltwater runoff during the summer. This would mimic a real glacier and provide water for irrigation during those two crucial months,” says 81-year-old Chawang Norphel, the pioneer of artificial glaciers. 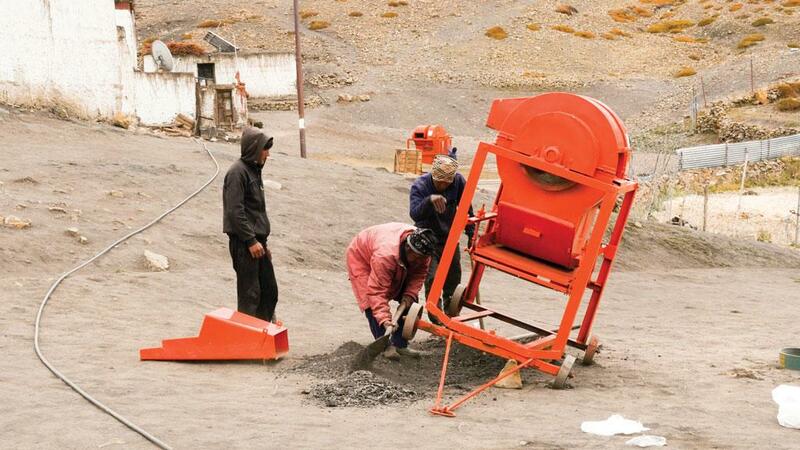 Fifteen villages around Leh have benefitted from artificial glaciers in the past decade. The solutions, though novel, are unlikely to work for long because the new climate reality in the region is not only dire, but also unpredictable. Saboo, a Ladakh village of about 1,000 people, was badly hit during a cloudburst in 2010 and again in 2013. The village, apart from losing people and houses, also lost an artificial glacier that had been painstakingly installed in 2009. At the same time, people living in these pristine areas are slowly embracing polluting technology and are also encouraging tourism for economic gains. In September this year, the 15 Komik families for the first time purchased three diesel-guzzling threshers to help cut barley crops. The families say the purchases were done because of the convenience, which is surprising because their produce is reducing every year due to climate change. Ladakh has seen a six-fold increase in tourism since 2004. This has pushed the local economy, but has also put added pressure on natural resources, particularly water. “We have started mass awareness about climate change impact and strengthening our disaster response mechanisms. But on the policy front, we are impeded by lack of information around the dynamics of glaciers—how they behave and are likely to change—without which we cannot become climate resilient,” says Phunchok Dorji of the Ladakh Autonomous Hill Development Council. While global warming has been affecting the Himalayan glaciers for decades, research on its impact has started recently. In 2013, Parmanand Sharma, a scientist with the National Centre for Antarctic and Ocean Research (NCAOR), set out on an ambitious task to carry out basin-wide field research of glaciers. Armed with little more than makeshift tents, he set up a camp in Spiti’s Chandra river basin, which is over 100 km from Komik. The objective was to study basin’s glaciers, which date back to the last Ice Age, about 2.5 million years ago. At the peak of the Ice Age, individual glaciers are believed to have run for over 100 km. Currently, Himalayan glaciers seldom exceed 30 km in length and yet are responsible for the existence of some of India’s main river systems. “You see these rocks, there is still ice below it but it is dead ice, cut off from the glacier. At some point in history it would have been part of an active glacier,” says Sharma, standing about two km from the snout of the Sutri Dhaka glacier, which is one of the 146 glaciers in the basin. The Himalayas represent one of the biggest missing pieces in the climate change puzzle. A lot of the uncertainty regarding Himalayan glaciers stems from the fact that field-based observations required to corroborate findings made from satellite images do not exist. “Most of the data on Indian glaciers has come out from remote sensing, which gives important information of glacial retreat. It, however, is insufficient to calculate the change in the volume, which can only come through ground data,” says A L Ramanathan, dean, School of Environmental Sciences at the Jawaharlal Nehru University (JNU). Ground-level data is available for just 25 of the 9,575 glaciers in Indian Himalayas listed by the Geological Survey of India (GSI). “We are not even sure of the contributions of glaciers to river systems. This is why it is important to take up as many field research projects as possible. We have just begun our progress down this road,” says Thamban Meloth, head, cryoshphere research, NCAOR. Last year, NCAOR set up HIMANSH, India’s first high-altitude facility, three km below Spiti’s Sutri Dhaka glacier, which is at a height of 4,503m above sea level. The facility is being monitored by a team of six researchers and is led by Sharma. It consists of two accommodation units and a lab. The team is currently studying six glaciers in the basin. “Over here we find a good mix of glaciers of various sizes and conditions that we can study. The size of a glacier influences its behaviour and responses,” says Sharma. Small glaciers constitute about 70 per cent of all the glaciers in the country, but only form about 10 per cent of the total glacial area and contribute little to major river systems. Three kilometres past the snout of the Sutri Dhaka glacier, Sharma stops to show one of the stakes installed by the team. “When we installed this stake, back in 2014, it was inserted to a depth of 12m, now just 2m remains under the ice.” Sharma’s team has put in 40 stakes across the 20 sq-km glacier to measure the level of thinning. After an arduous six-hour trek over boulders, angular moraine rocks and sharp ice, the team finally reaches the camp set up by Sharma’s team about seven km into the glacier, just as the blue sky begins to turn grey. Tents provide respite from the cold winds and snowfall that overtook clear skies in a matter of minutes. But there is no escape from the cold emanating from the solid ice beneath the rocks on which the tents have been set up. Over the next two days, the team takes readings from the two weather stations set up on the glacier—one near the camp and the other installed a further seven kilometres into the glacier. The team also collects ice samples to analyse the biological and chemical signatures. These, Sharma says, are vital in understanding how glaciers behave and how different factors impact them. The team’s primary concern is the mass balance in the glaciers that feed the Chandra river basin. “Currently we have very limited estimating ability of how much ice we are losing and at what rate, how much of this finds its way into the river. We find that meteorological and geophysical factors play a major role. So we are analysing changes in the ice thickness and discharge levels at different points in the basin and correlating it with meteorological observations,” says Sharma. The team has so far relied on ground-penetrating radars and stakes to estimate the depth and thinning of ice cover but this year, for the first time, Sharma will also use a Terrestrial Laser Scanner, which provides wide-angle 3D information of the topography. This, he says, will reduce the time required to survey glaciers and mountain faces. The team is observing two glacial lakes in the vicinity—Samudra Tal and Gepang Gath. Comparing them to spy satellite images from the early 1970s, recently declassified by the US intelligence, Lavkush Patel, a member of Sharma’s team, shows the incredible expansion of the two lakes over the past 40 years. “The expansion of both lakes is clear. Since 2014, I have seen large chunks of ice calve and capitulate into Gepang Gath lake from the snout of the glacier. This sort of calving was unheard of outside the polar region and yet we can already witness it in Himalayan glacial lakes,” says Patel. Researchers are also looking at how debris affect the glacier behaviour. The glaciers around the Chandra basin have different degrees of debris cover of mountain rocks, making it an ideal place for studies. “We find that thin and intermittent debris absorb solar radiation and cause heavier melting, but a thick and uniform cover actually insulates and protects the glacier,” says Patel. In another first this year, the team has installed thermistors up to 15m below the surface to check temperature differences inside the glacier. While 15m is still considered to be the surface of glaciers that have depths running into hundreds of metres, installing these strings is easier said than done. The process requires hours of patient steam drilling through hard compact ice found just a few metres below the surface. “Temperature profiling will give us a clear picture of the energy transfer and the changes in the ice that accompany fluxes in energy and temperature,” says Sharma. Further north, another team, led by veteran glaciologist Renoj Thayyen from the National Institute of Hydrology (NIH), Rourkee, has installed thermistor strings up to 10m in glaciers around Ladakh’s Khardungla mountain pass, which has one of the world’s highest motorable roads. Thayyen’s ambit and scope of research differs slightly from his counterparts at NCAOR. “We have chosen this area because of its popularity among tourists and the heavy vehicle load in the roads around it. Ladakh is primarily fed by its glaciers and changes here are important in the water budgeting of the region. We are focusing on the catchment area instead of just individual glaciers,” says Thayyen. On the day Down To Earth visited, Thayyen’s team was busy setting up an automatic weather station on Khardung, a small glacier of just 0.56 sq km but sensitive owing to its proximity to Khardungla. The impact of the road is clearly visible on the glacier, its road-facing front streaked with black soot. Thayyen’s team will monitor climatological conditions on two glaciers around Khardungla—the small Khardung and the larger Puche glaciers (15.7 sq km)—and correlate the data with quantitative and qualitative data collected from discharge stations downstream of the glacier. The team has been busy over the past few years compiling information on the winter and summer mass balances, surface energy balances and the isotope characteristics of the two glaciers. Thayyen hopes to expand his research into the effects of black carbon, which is suspected to increase melting and influence extreme weather events. The ultimate objective of the two projects in Spiti and Ladakh is the same: to be able to model the behaviour of the Himalayan region, in line with models for other geophysical systems across the world. “Models available for glacier behaviour in mountains are based on the well–studied conditions of the Alps mountains, which cannot be applied to the Himalayas,” says Thayyen. “Indian glaciology is still in its infancy. There are too many gaps in data and records are poor. So data collection is the priority at the moment,” says Mohammad Farooq Azam, one of the few trained glaciologists in the country. Azam says there are still a lot of obstacles that need to be crossed before we can claim to understand Himalayan glaciers. Unfortunately, he says, many of these are financial and bureaucratic. Azam’s claim is confirmed by members of both teams that interacted with Down To Earth and was clearly visible even in the investment in the two projects. 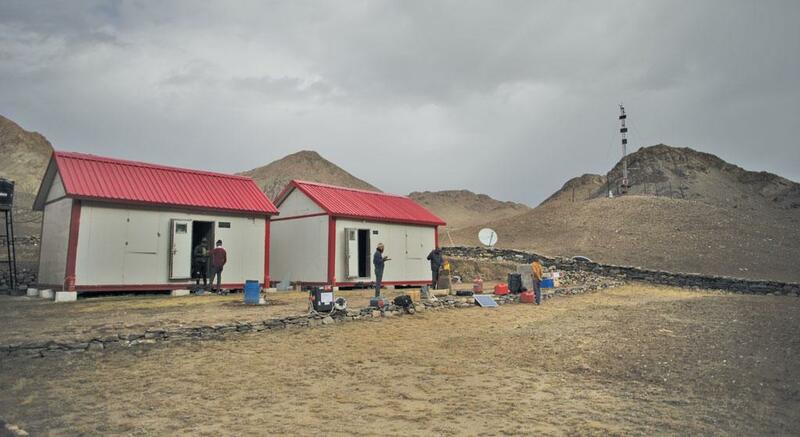 While HIMANSH is funded directly by the Indian government, the NIH project in Ladakh is being carried out with the funding from government-run Science and Engineering Research Board on a per-project basis. While the NCAOR team has a fully equipped station, the team from NIH uses a single bare prefabricated unit for accommodation. Also, the NIH project is supported by a team of four porters on temporary payroll while there are 10 porters permanently at HIMANSH. These porters play a crucial role in the success of most mountain missions. Finance is one hurdle, red tape is another. “Getting permission for equipment can take years. Completion of the HIMANSH station was delayed because of this,” says Sharma. Another problem is the lack of trained professionals, says Bhanu Pratap, a HIMANSH researcher who is also part of India’s Antarctica expeditions. “Paucity in funding has actually trickled down to a lack of trained human resource. This is dangerous,” he says. This is changing, slowly but surely . “Department of Science & Technology, along with the Swiss government, is training 80 glaciologists, of whom 40 will receive advanced training,” says Ramanathan. The biggest fillip for glaciology in the country, though will come from integrating science into policy and planning. “Research is coming in, but its application is missing. Water budgeting and policy has so far been unaffected by research findings. There needs to be a greater importance to these, the other problems will get resolved if this is first corrected,” says Thayyen. Science, in general, finds its value in application. Glaciology is no different. Yet more than a generation after India’s Department of Science and Technology first involved itself in glacier research in the early 1990s, applications of glacier research are a striking miss in India’s developmental plans. India’s policies on water, environment and security, all impacted by glaciers, have barely moved beyond passing references to glaciers. “For a long time, glaciers were neglected because we did not see much as we were worried only about the water in the rivers,” says Ramanathan of JNU. Suba Chandran, director, Centre for Internal and Regional Security, the Institute of Peace and Conflict Studies, says glaciers do not feature in international treaties or negotiations even though they “will likely have an impact on discharge and water budgets. Agreements rather focus on water that is already flowing”. The National Climate Change Action Plan, submitted in 2008, was the first policy document that recognised the need to incorporate glaciers into water budgeting and policy. But nine years down the line, research in the subject is still disparate and disjointed, say experts. Incredibly, even the number of glaciers, the total area they cover, and the total volume of water stored in them remains clouded in uncertainty. 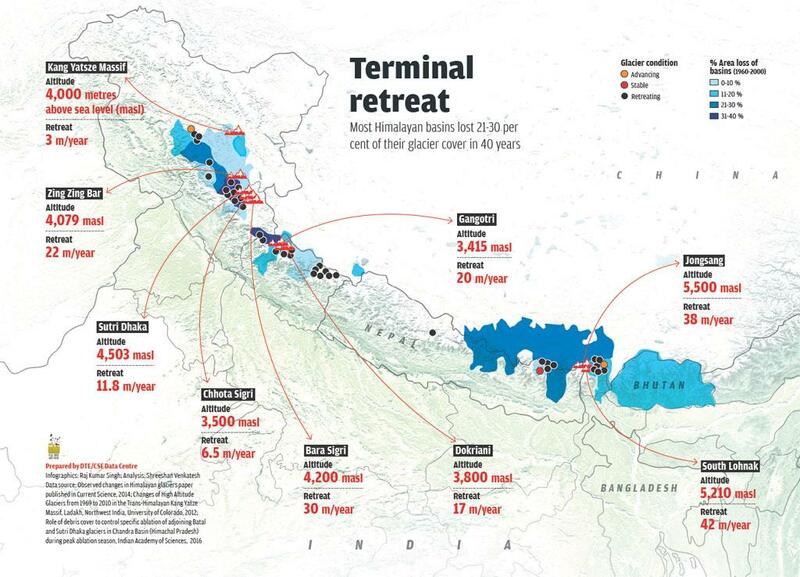 Take two of the most extensive monitoring exercises of the Indian Himalayas for instance. A 2014 report published by the Indian Space Research Organisation (ISRO) says that between 2001 and 2011, the Himalayas lost 0.2 per cent of its glaciers. Another study, published in the same year, by the Diwecha Centre for Climate Change estimates that in 40 years the Himalayas had lost about 13 per cent of its glaciers, equivalent to about 443 billion tonnes of ice. The report estimates glacier retreat to be between a few metres to over 60 metres per year at different parts of the range. On the same matter, the then environment minister late Anil Madhav Dave quoted a rate between five and 20 metres. Currently, at least a dozen Indian institutions are studying glacier behaviour. “Glaciology is a slow moving science and requires long-term concentrated efforts. What is required is to move beyond a university-led project approach and towards a unified approach by setting up a centralised body that can manage and compile standardised research pertaining to Himalayan glaciers. Unfortunately, attempts to establish such a national centre in the past have fallen flat,” says Anil Kulkarni, who carried out the research at the Diwecha Centre for Climate Change. He is referring to the now-struggling Centre for Glaciology (CFG), which was announced in 2009 as a reaction to the 2007 Intergovernmental Panel on Climate Change (IPCC) assessment that the Himalayas would be devoid of glacier cover by 2035. In fact, the IPCC assessment, which was later found to be wrong, served in galvanising both the scientific and political voices in India. “The government decided to set up the autonomous institute in Mussourie with a separate building and staff strength of 80 experts in glaciology. Despite several attempts, we hit a brick wall every time,” says Anil Gupta, the then director of the Wadia Institute for Himalayan Geology (WIHG), which currently houses CFG. Even the 12th Five-Year Plan included a detailed plan to establish the glaciology centre in Uttarakhand by 2013 with regional centres in Himachal Pradesh, Sikkim and Jammu and Kashmir. Eight years since the plan was first put on paper, the vision to set up a national centre has all but dissipated. CFG, far from occupying its own building, remains an annexure of WIHG. Instead of 80 staff members, it currently employs just 19 people, including PhD researchers. “The hope of setting up a national hub for research seems to have now been put on the back burner. The initial enthusiasm wore off in a few years,” says D P Dobhal, director of the centre at WIHG. The glaciology centre has now completed the initial period for which it was sanctioned and a source working closely with CFG says it is no more a priority. “There seems to be no future,” says the source, adding that close to 50 per cent of the Rs 23 crore sanctioned for the centre remains unused. The lethargy is not limited to Central government agencies. While climate change action plans submitted by Himalayan states rest heavily on strengthening the knowledge and conservation of Himalayan glaciers, not much has moved on the ground. While the Himachal Pradesh climate cell website lists a few monitoring projects, none are listed on the Uttarakhand site. Neither state has listed any conservation activity, as detailed in their action plans. “We have been monitoring glaciers in state and are in the process of updating our inventories,” says S S Randhawa, senior scientific officer, Himachal Pradesh Climate Change Centre. The sluggishness in incorporating glaciers in policy can partly be attributed to a disconnect between different departments and ministries in the government. “Often it is the case that there are several institutes under different departments that are working in parallel on inter-disciplinary subjects like glaciers. But institutional linkages within and between ministries and departments of the government are still weak,” says Chandran. “We often face frustrating delays because we are not on the same page as water resource officials even though ultimately we are concerned with the same discharge of water,” says Renoj Thayyen, NIH scientist. While the science is still far from being settled, glaciology in India can only move in tandem with policy. And at the moment it appears as if science and policy on glaciology seem locked together like the Ouroboros—the serpent from Egypt mythology that consumes its own tail.